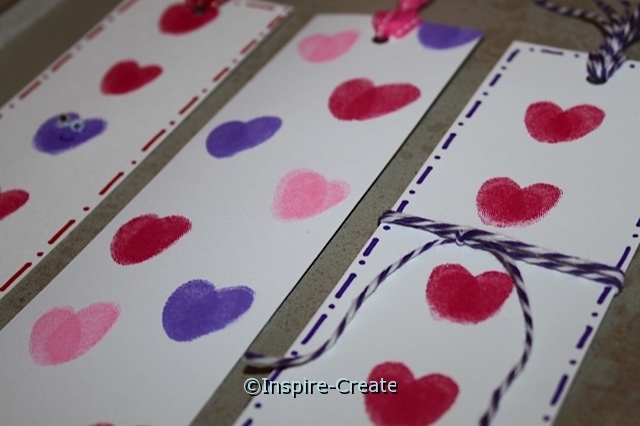 March 24, 2015 /1 Comment/in Bookmark Ideas, Valentine Crafts /by Craft Supplies for Less, Inc.
DIY.. Heart Bookmarks that kids can make! These bookmarks only require a few inexpensive craft supplies and make a great gift when finished. 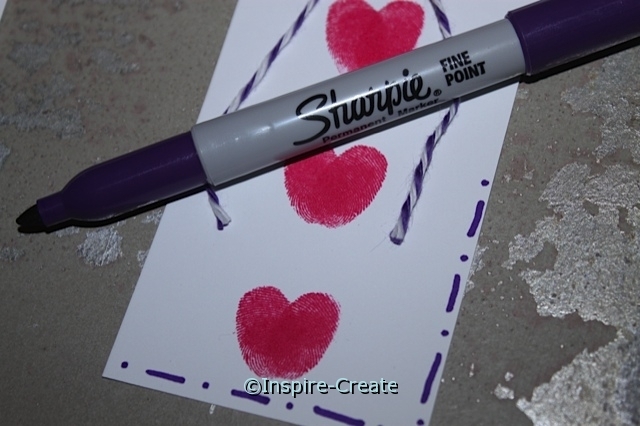 Kids will enjoy making hearts with their finger or thumbprints and personalizing their bookmarks with markers and wiggle eyes! This is a great classroom or library craft. Perfect group craft for Valentine’s Day, girl parties, or a fun rainy day craft for school aged children! Use a pre-cut white bookmark insert, ribbon &/or baker’s cotton, tiny wiggle eyes, assorted ink pads, and (of course) a fingerprint or thumbprint! 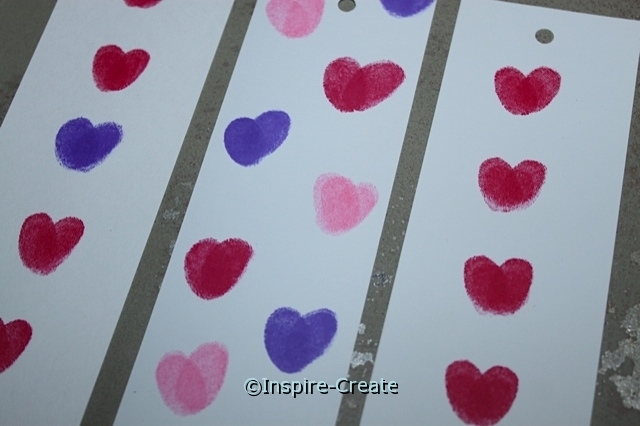 Hearts are easily made with 2 fingerprints or thumbprints.There is no cutting or drying time required. The perfect kids craft that can be made and sent right home. These bookmarks make a great personalized gift for family and friends too! 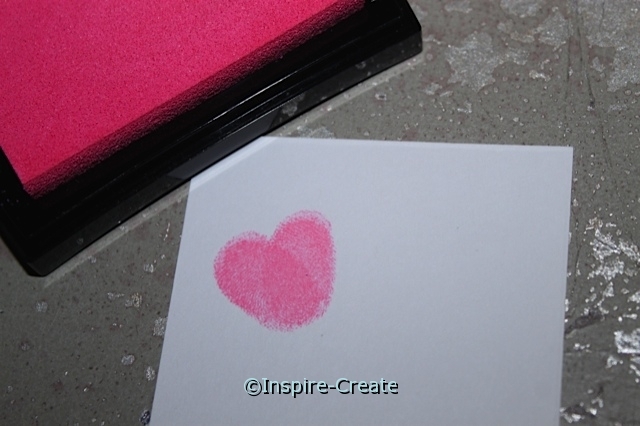 Start by pressing finger or thumb onto a rubber stamp ink pad. Then press finger onto White Bookmark Insert (we used Medium size inserts) at a slight angle to the left or right. Press finger/thumb into ink pad again and then finish the heart by pressing finger onto paper at the opposite angle (see below). 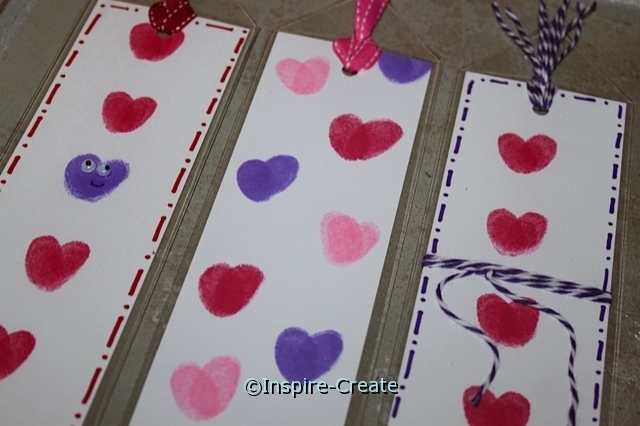 Kids can add hearts all over insert, in a row, or in any pattern they like. Change ink colors easily by using a different finger! Have a wet paper towel handy for easy clean up. Some inks come off fingers with just a little water, others require soap and water clean up. Just for fun add Tiny 5mm Wiggle Eyes to some of the hearts. 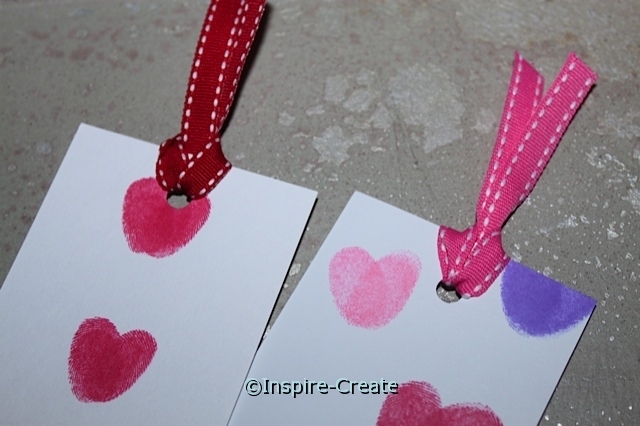 These are small enough to fit into the bookmark sleeves and are super cute on the hearts. Use Mini Glue Dots to attach Wiggle Eyes with no drying needed. Add a small smile under the wiggle eyes with a fine point Sharpie Marker (see below). 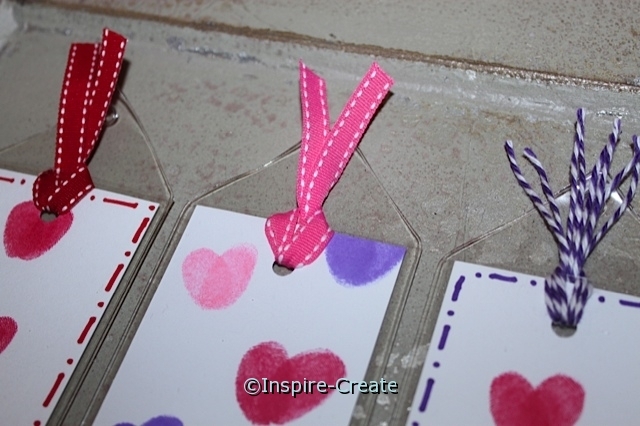 Embellish bookmarks with Sharpie Markers. 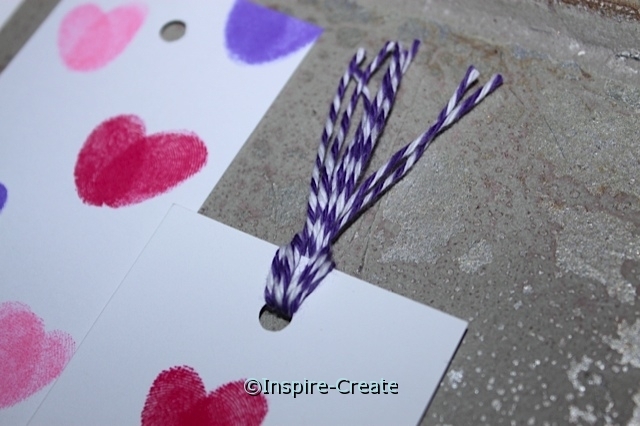 Draw lines around the edges, make polka dots, personalize with child’s name, or add the date the bookmark was made. 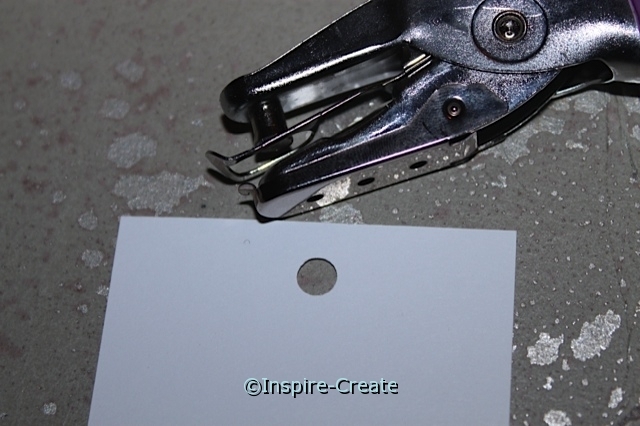 Hole punch the top of the white paper insert with a standard 1/4″ single hole punch in the center at the top. The hole will be used to add Saddle Stitched Ribbon or Baker’s Cotton to finish. Add either Saddle Stitch Ribbon or Baker’s Cotton to the top of the insert. It only takes about 7″ of ribbon to loop through the hole. Pull the ribbon carefully to avoid tearing the hole. If using Baker’s Cotton use 4) 7″ strands to make the top tassel. Fold Baker’s Cotton in half and push looped end through the hole at the top of the insert. Next, thread ends of Baker’s Cotton back through the loop and pull to secure to bookmark insert. Use caution when pulling to avoid tearing insert. Baker’s Cotton can also be wrapped around the middle of the bookmark insert and tied to hold in place. Here is what the Heart Bookmark looks like with Saddle-Stitched Ribbon instead of Baker’s Cotton. Simply cut a 7″ piece of ribbon, loop through the hole, feed the ends through the loop, and pull carefully to secure to the top of the bookmark insert. The final step for these Heart Bookmarks is to slip the insert into a Clear Vinyl Bookmark Sleeve. We used Medium size Sleeves and Inserts for this craft. The vinyl sleeve will protect all the kid’s creativity and help the bookmarks last for years! Hello. This site was very helpful for our bookmark project. We just returned from a mission trip to Haiti. We’re creating bookmarks for our team and donors. We also created an 8-minute video that shows our experience on the trip (I pasted the link in the website box). Just sharing to create awareness for the extreme needs in Haiti. Thank you and God Bless!